I damn near bought two obviously old shirts at the Goodwill last weekend, cause they just looked so comfy… But I have plenty of old clothes bought new… Really, I do. That is a line for the ages and it sure speaks to our crazy consumer culture. 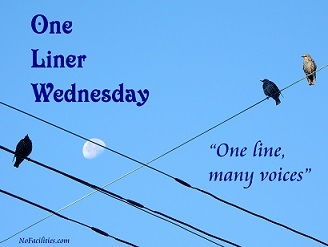 Pingback: One-Liner Wednesday: Old Friends | Anything is Possible! I get most of my old clothes at the thrift store. All of my clothes are old. No, wait! I bought new black socks a few months ago! Aw, that’s funny and sweet! I think “old clothes” might be the $100 pair of jeans with holes in the knees. Haha! Yeah, what’s up with that? I really don’t either. I come by my holey jeans honestly! Though I have to say when we do things that require old clothes in nursery, it’s amazing how many people come in, in new ‘old clothes’!